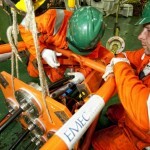 EMEC provides five subsea cables at the Billia Croo wave test site, and seven at the Fall of Warness tidal test site. This chart provides a graphical display of the tidal test site at the Fall of Warness and the associated infrastructure. This chart provides a graphical display of the wave test site at Billia Croo and the associated infrastructure. The cables at both sites are broadly similar, with an 11kv cable running from an onshore substation out to each open-sea berth. armoured with two layers of galvanised steel wire. In 2010, a UK Department for Energy and Climate Change (DECC) funded project (further details below) enabled us to increase our berth capacity by installing two additional cables at the Fall of Warness and one additional cable at Billia Croo. The cables, built by Draka in Norway, are of a similar specification to the first cables described above with the inclusion of an additional 4 core 4mm2 auxiliary power cable. The conductors on the Billia Croo cables are 50mm², giving a nominal rating of 2.2MW, while the conductors for the Fall of Warness cables are 120mm², giving a 5MW rating. 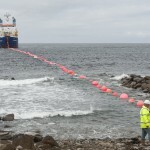 The cables were laid as standard subsea cables on the sea bed. As the cables approach the shore, in 15m of water, ductile iron cable protectors are attached to provide additional protection. At the low water spring tide mark, each passes into a trench dug 12m into the seabed and beach. Onshore, the cables are fed into a manhole and then into the substation. In the substation, each cable terminates at an 11kV circuit breaker, along with the tripping cable. The fibres are terminated in the communications area of the substation. 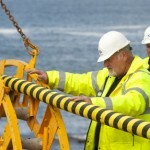 At the seaward end, each cable, when not occupied by a developer, is terminated using a specially designed connector provided by J+S Ltd (now SEA), which allows us to carry out planned condition monitoring of any cables not in use by developers. These terminators can, if required, be converted into splices to enable developers to use umbilical cables to attach their devices to our cables. While a great deal of experience has been built up in hostile marine environments within the oil and gas industry, the hardware, operational aspects, maintenance and people do not have the experience of operating in fast tidal flow areas. 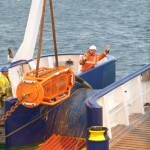 Therefore the boundaries of marine renewables were pushed to the outermost limits when two new tidal cables were laid in aggressively high tidal velocity for the very first time by a dynamic positioning (DP) vessel (by Global Marine Systems Ltd). 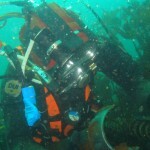 The vessel, crew, hardware and procedures all worked at the very ultimate limits of their knowledge and ability. 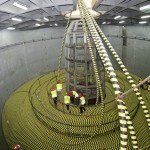 An additional cable was also installed at the wave test site. All the cables laid were fitted with new industry leading cable end terminations, allowing developers faster, safer and easier connections of their devices to the grid, thereby cutting down developer costs. These terminations were designed by J+S Ltd (now SEA) from a specification drawn up by EMEC. With this success, we have provided feedback to the industry on what can be another solution for developers wishing to utilise new techniques and procedures for getting their device in the water. 2018: CLEMATIS (Cable Lifetime Enhancement via Monitoring using Advanced Thermal and electrical Infrastructure Sensing) project, funded by Innovate UK. 2016: ORCHIDS (Offshore Renewable energy Cable Health monitoring using Integrated Distributed Sensor systems) project, funded by Innovate UK. 2015: Subsea cable lifecycle study, funded by the Crown Estate.